The evening options below are popular evening activities among cruise ship passengers. If you are interested in some of them, please contact us for prices. Please note that any evening activities should be included into your cruise visa tour program, so we need to know about them before your arrival. I don’t recommend to go back to the ship to change in the majority of cases – theaters are very democratic now and riding back and forth through traffic jams is just a waste of time. 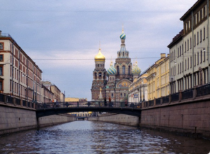 Saint-Petersburg is often called the Venice of the North because of its many rivers and canals. No wonder that boat rides in St Petersburg are extremely popular as they allow to see the main city attractions from different angle. Typically boat rides in St Petersburg last for about an hour, they take place from morning till late night as many tourists want to see the opening of bridges at night. Prices vary and are usually about 1100 rub per person depending on length and time of the cruise (night boat rides are more expensive). Please note that the majority of boat companies provide commentary only in Russian. If you are interested in taking a boat ride along rivers and canals in St Petersburg, I can book the tickets for you. Please contact me at stpetetrip@gmail.com to discuss the options. Boat rides will start in late April – early May 2018. 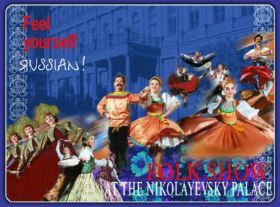 “Feel yourself Russian” is one of the oldest and most well-known folk-shows in St Petersburg. For almost 2 hours you will be entertained by Russian folk singing and dancing. The show takes place in the cozy concert hall of Nikolaevsky palace, in the middle of the performance a break is made during which you’ll be served free refreshments and canapés. Important notice:All tickets are without seat numbers, you can see the stage quite well from all the places, but if you want to take some specific seat you should appear about 20 minutes before the performance. Most of the time the show runs daily, please contact me to find out the details and starting time. 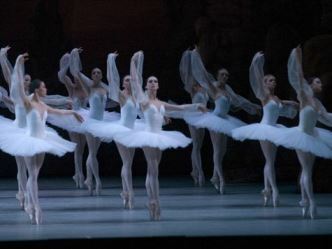 Russian ballet is very famous for a reason. There are quite many theaters that stage ballet in St Petersburg, but I would recommend either Mariinsky or Mikhailovsky theaters. Make sure to book in advance – these places are very popular. Most likely tickets will be expensive, but they are worth it. You can buy tickets on the websites of the theaters listed below & we will provide transportation. Please contact us for details. Mikhailovsky theater – https://mikhailovsky.ru/en/ (Mikhailovsky theater sometimes has problems with online payments). Faberge museum is open till late, so it’s possible to visit it after the main sightseeing program. It has a breathtaking collection of Faberge eggs and other jewelry from the end of the 19th-beginning of the 20th centuries. Private tours of Faberge museum are ridiculously expensive, so I usually recommend to take audioguides or just go there on your own. The guide will meet you after the visit and will deliver you to the port. To receive news, travel tips and tour packages via email.